The patented SSGB-8B Skid Steer Grader Blades are designed to be used by asphalt, landscaping, and concrete flatwork contractors. 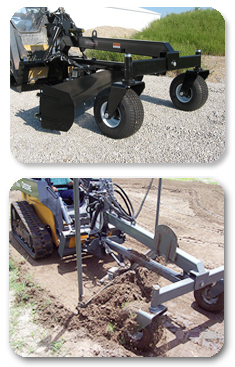 These skid steer attachments have an 8-foot, six-way hydraulically controlled moldboard operated by an in-cab remote. With an optional laser system, the grader blade attachment will maintain grade to tight tolerances. To help prevent damage, the moldboard is shear pin protected. Unit comes complete with 1/2" "connect under pressure" flat-faced hydraulic couplers and a reversible beveled cutting edge for long life. Optional End Plate Kit (Pair, #811980) and Laser Pole Kit (Pair, #812110) available. View our literature.